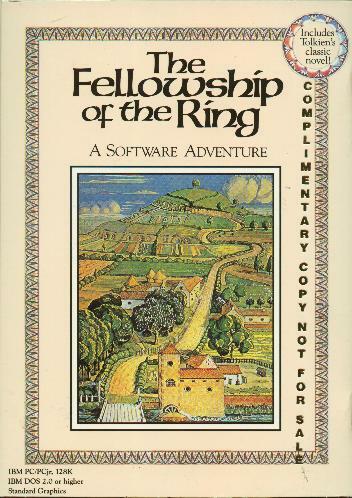 The second Tolkien-based game by Melbourne House (The Hobbit was the first), Fellowship was distributed in the United States by Addison-Wesley, though the actual design and code work were done by Melbourne. The European title for this is Lord of the Rings: Game One, but they're otherwise identical. This is a "complimentary copy" (most likely a promo for a magazine review, or a dealer demo) with gold lettering imprinted on the package cover.